Wonder Valley, CA: WEMO letter to download and send: DEADLINE: JUNE 4! WEMO letter to download and send: DEADLINE: JUNE 4! 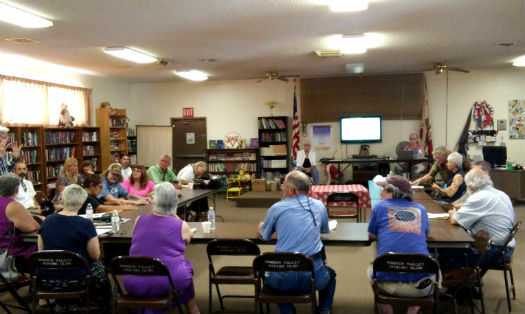 The community met to view Pat Flanagan's presentation on the BLM's WEMO plan last Saturday. 38 people attended, which isn't bad for a beautiful Saturday on Memorial Day weekend. Wonder Valley community meeting. Other people are sitting on the sides and in the back. Many thanks to Pat Flanagan for all the work she's done on this issue. Thanks to Star Javier for opening the Community Center on a Saturday and helping with set up and clean up. Thanks also to Donna Landry, Ken Sitz, Bob Tellefson, Izzy, and Jill Reinig for helping with the meeting. Thanks especially to everyone who attended. Download, edit, print, sign and send. Feel free to add your own personal notes regarding the OHV issue to the letter. If you have ANY trouble downloading this write to me at teresa.sitz@gmail.com and I'll send you the letter by email. The desert represents freedom, the freedom of choice, of open spaces, to explore, to be . I personally learnt to ride a motorcycle for the first time in the wide open spaces of Wonder Valley - it would be a shame to see these kinds of restrictive mainstream ideologies being brought to the desert so that the culture of freedom and what the desert is all about can be suppressed just like the places they fled...Lets bring in rules so that people can learn to not think for themselves, to not negotiate with their neighbour, to not accept each other as human beings and each others ways of being....this petition is a sorry representation of humanity! Having Wonder Valley open to all OHV would be a big mistake, the piece and quiet that we have would be gone and replaced with loud OHV's , it is not to bad when there are just 1-3 running past the house but if there where large groups coming from all over , the dust and noise would be bad, the animals out here would loss their homes and the plants would be gone which is the main food and water for them. And the roads that we are now paying for will be shot , after many OHV's use the road for a weekend the roads will be gone and will have to be redone. As it is now our TAX's will go up this tax year and the OHV users will be using them for free while we pay for them.